After a woman in Texas made headlines for getting banned from a Walmart for riding around their parking lot on an electric shopping cart, drinking wine from a Pringles can, the idea for a cleaner wine container came about. TAMPA, Fla. — You no longer have to be judged for drinking wine from a Pringles can. An Etsy shop is selling tumblers with the Pringles logo printed on them. 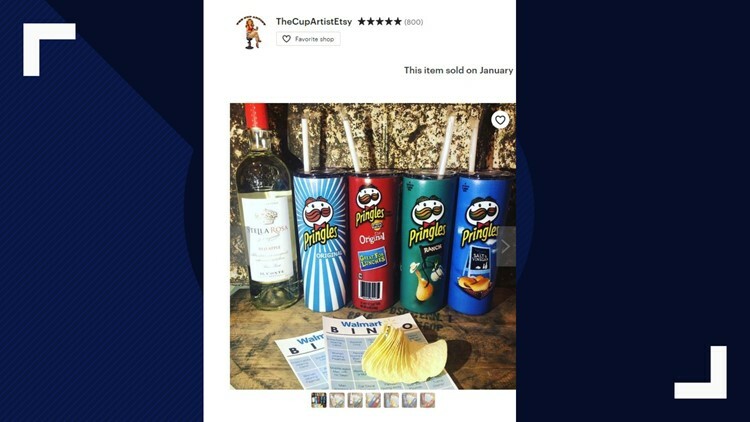 After a woman in Texas made headlines for getting banned from a Walmart when she was accused of riding around their parking lot on an electric shopping cart, drinking wine from a Pringles can, the idea for a cleaner wine container came about. The tumblers are being sold in original, ranch, and salt and vinegar flavors on Etsy. The Etsy shop gave a nod to the Texas woman’s Walmart adventures in its description of the tumblers. “Great for your friends or moms that endure long trips in Walmart and need to drink wine from a Pringles can,” it reads. TheCupArtistEtsy says the 20 oz. tumblers come with the straw included and are a slim shape, perfect for ladies’ hands.